Installing a sauna is a simple and rewarding project that can be accomplished by virtually anyone with a hammer and the ability to read basic instructions. Sauna installations are a little easier than building a sauna, which requires precision cuts and a little more of your time. If you’re not up to the task (or don’t own the proper equipment) to make exact cuts with fragile material but you want to save money on installation costs from a professional company, then installing a sauna yourself is an excellent solution for you. If you’re considering taking matters into your own hands and installing your sauna, there are two popular options that you can take. You can either order a pre-built/pre-assembled sauna that requires virtually no construction skill at all, or you can choose to order a pre-cut kit that you assemble yourself. Both varieties offer high quality material that yield exceptional results; it really just comes down to your budget and how much time you wish to put into the install. Out of the common types of sauna installations, pre-built (or prefabricated) sauna kits are the easiest to install. These kits are extremely popular among sauna manufacturers and allow you to effectively install your unit without having to deal with the potential hassles of cutting material and assembling the pieces yourself. 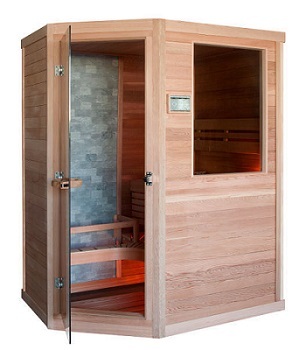 These kits are very simple and straightforward, and include all of the essential components of a quality sauna. Custom kits are slightly more hands-on than pre-built saunas, however most sauna manufacturers conveniently provide in-depth information and details of how to properly assemble and install these units. Custom kits are cut and designed to accommodate your requested specifications. Although these kits require a little more time and effort on your part, they’re very basic as far as construction is concerned and do not require experience in a specific craft. 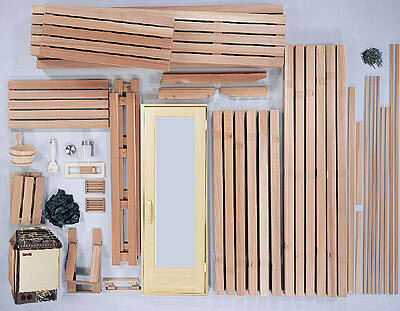 Custom sauna kits are pre-cut by the manufacturer and delivered in pieces that you will need to assemble. The material for these kits typically entail the side and back walls, front wall with pre-cut door, and ceiling. Installing a pre-built system is a very straightforward process since the sauna is already pre-assembled and delivered intact. Once you’ve designated a space in your home for your sauna, all you need to do is simply secure the unit and plug it in. The manufacturer will provide basic instructions for you to assist in mounting the unit, and after you’re finished you begin using your sauna. First, you will have to designate an area for your sauna. Using the specific instructions from the manufacturer, secure the frame and flooring in place. Next, lay the fiberglass insulation and foil face vapor barrier. This will allow your sauna to efficiently hold head inside the unit and prevent the risk of fire. Lastly, the electrical components will need to be wired. If you’re not a skilled electrician, do not attempt to do this yourself. We strongly recommend consulting a professional electrician to do this for you, as high voltage components can be dangerous to handle. Following this layout and the precise instructions provided by the manufacturer will ensure that your sauna is properly installed. If money is tight and you’re looking to save a few dollars, you should consider ordering a pre-cut sauna. Since pre-cut saunas are not assembled at delivery, they’re typically much cheaper than pre-built units. Generally speaking, pre-cut saunas are anywhere from $1,000 – $3,000 cheaper than pre-built saunas, however they require a little labor and more time than pre-built varieties. Before installing your sauna you will need to first consider these factors. Regardless of the route you choose, you will no doubt find extreme pleasure and relaxation with your new sauna.